The big attraction for me to visit Roberto Barrios in Mexico’s Chiapas state wasn’t the waterfalls, it was to see the Zapatistas. The autonomous community near the Mayan ruins of Palenque is one of the strongholds of Mexico’s Zapatista National Liberation Army (EZLN), which burst onto the internal scene in 1994 on the same day the North American Free Trade Agreement (NAFTA) came into effect. The movement, which continues to advocate for the indigenous in this poor region that borders Guatemala, has a knack for garnering international attention and was a favourite cause of Rage Against the Machine. Although the turmoil and violence of the 1990s struggle has diminished, the state remains off the beaten track for most tourists who come to Mexico in search of sun, sand and surf. To enter Chiapas, our G Adventures tour group had to pay a road “toll” to a group of men who had laid a log and several large rocks across the road near the Zona Arqueológica Palenque. They only let us through after we promised we were coming right back — our empty van did anyway. Two days later, after exploring the incredible Mayan ruins, we travelled to Roberto Barrios in a 15-seater on a well-kept highway that twisted up above the dense jungles and an active quarry, offering magnificent views of the misty hills beyond. The first sign you’ve entered the autonomous territory is a white road sign – blink and you’ll miss it. Since we’re no longer obliged to follow Mexican rules of the road, our driver tells us, we’re allowed to clamber up onto the roof of the van for a 360-view of the sights. The land is lush and dotted with fields, cattle and the occasional home, which become more numerous as we enter the village proper. Once we’ve stopped, the van is surrounded by men and children who haggle with our tour guide over the cost of visiting the falls that day. 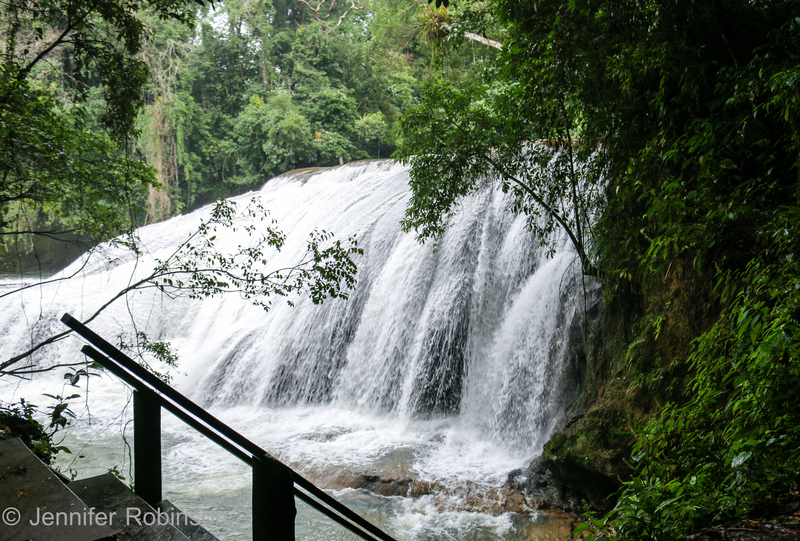 It’s been raining a lot in Chiapas during this time so the waterfalls are engorged with runoff. There will be no photos of tranquil, clear green waters this time. As part of our arrangement, we’re led Pied Piper-like by Marcos and Erubey down the jungle paths to several waterfalls. Joining them are a gaggle of their young friends who race ahead, dart out from behind trees and gently throw rocks at us to get our attention. No girls follow us. The only interaction we have with them is outside the van when they implore us to buy some homemade snacks and colourful woven bracelets. They don’t smile and they don’t bargain when it comes to their wares. They’re obviously smart cookies. We settle down next to the main waterfall and enjoy a few drinks as we watch the boys yank off their T-shirts and shorts to jump into the churning water. Two of our group brave the current and jump with them off a tree branch. Inside of swimming to the banks of the river, the boys sprint along the lip of the lower waterfall, leaping back into the water at the last second with impish grins on their faces for the camera. It’s terrifying the first time you watch them do it, until you realize they likely do it every day. Marcos, Erubey and their chums, who range in age from seven to 14, buzz around us like teasing flies. Everything we do is ridiculous to them. After all, being a tourist is pretty silly a lot of the time. Look at their big backpacks and their expensive hiking boots! Our visit didn’t afford us much opportunity to tour the community, to see the church or the school. It was very much an in-and-out operation. Not speaking Spanish also made it difficult to learn more first-hand about Roberto Barrios and the way the Zapatistas run their territory. 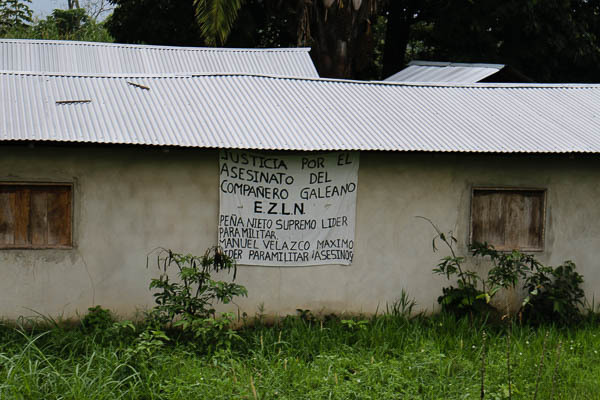 The only visible trace of the EZLN we saw was a banner slung along the roadside calling for justice in the 2014 death of José Luis Solís López (a.k.a. Compañero Galeano), an education worker with the Zapatistas. At this point, the area is unspoiled by the usual tourist trappings and amenities and we didn’t see another soul from outside. Roberto Barrios is well worth the trip if you’re driving or can find someone willing to take you.